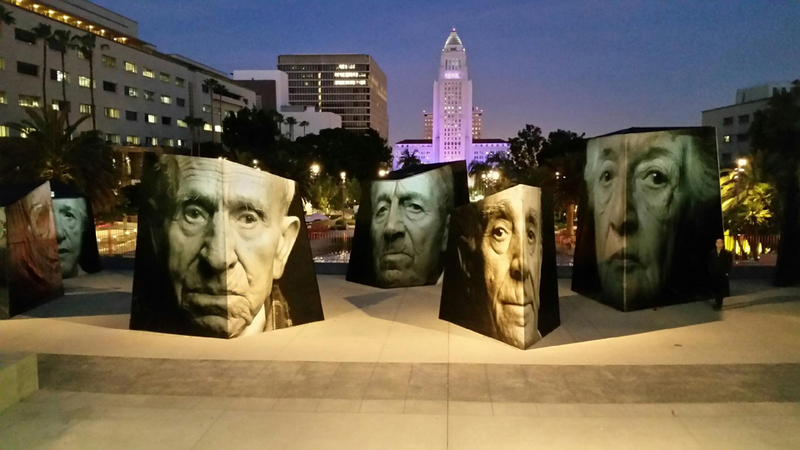 Levon Parian stands by his exhibition honoring the 100th anniversary of the Armenian Genocide, titled "I Witness." Photo by Ara Oshagan. Showcased at Los Angeles Grand Central Park, Parian’s 24 mammoth photo sculptures stand out at the epicenter of a maze-like installation. Each of the structures is supported by 2,000 lbs. of cement at the base and 500 lbs. of steel for the frame to be able to withstand 125-mph wind, Parian said. 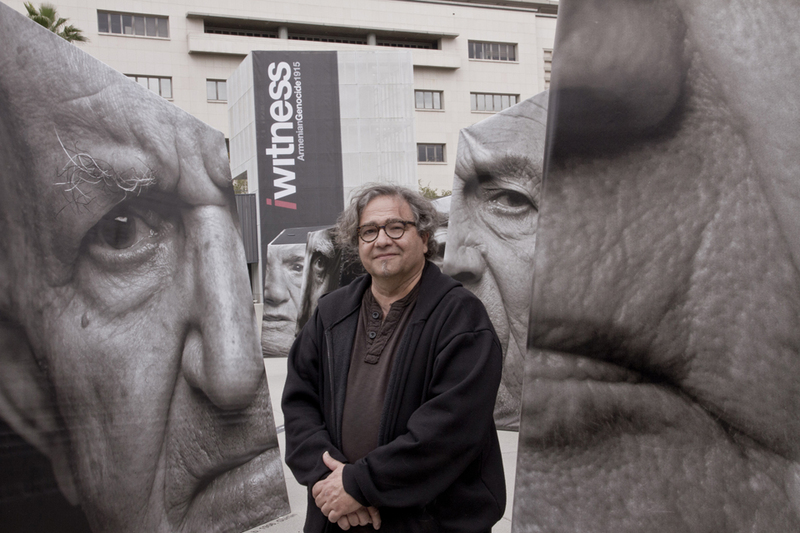 With this year being the 100th anniversary of the Armenian Genocide, Parian and his photography partner, Ara Oshagan, and architect Vahagn Thomasian used “iwitness” as a testament to the survivors in their show. The photo structures are part of a much larger project. Parian began photographing Armenian Genocide survivors in 1989. In 1996 he started to work with Oshagan on what is now called the “Genocide Project,” a series of more than 80 portraits and oral histories from eye witness survivors designed to bring attention to the genocide. As both sides of his family have survivors, his work is also a testament to them. “My mother’s parents fled to Jerusalem and stayed in an Armenian convent, and my father’s father was an Ottoman cavalry soldier who escaped to the desert and brought thousands of fellow survivors to safety,” he said. The show will be at Los Angeles Grand Central Park through May 31, but Parian said he hopes the park is just the first stop. Parian noted that the “Genocide Project” is ever developing. A book will soon be published with stories and images of survivors. “It’s a work in progress; it has been since its inception,” he said. For more information on the project go to iwitness1915.org.